Shower benches can serve as a decoration, extra storage space for bottles, a comfy spot to shave your legs, or maybe to just sit back and relax. Wooden benches are attractive and are appealing if you want a bench that’s functional but also brings natural color and texture to your bathroom. Metal and plastic benches are more practical than attractive. If you don’t care about looks and simply need a seat that’s lightweight and adjustable, then they’re for you. Teak wood has high oil content and tight grain that makes it exceptionally suitable for exposure to water. Bamboo is extremely versatile and has become popular for making laminate flooring, cabinetry, and furniture. It is highly weather resistant, but must be treated to resist insects and rot. Mold can be an issue which means it requires more cleaning than teak. Metal and plastic seats require the least amount of effort to maintain. You’re not going to be oiling up these benches. With that said, they’re not exactly pretty. But sometimes function trumps form, especially if you’re looking for something comfortable after a major injury or if you have poor mobility. The weight and density of teak wood gives a luxurious and timeless look that complements earthy color schemes or can provide contrasting color and texture in a contemporary style bathroom. Bamboo is lighter, and often less expensive than teak, but has a similar look. Picking the best bench is impossible as everyone’s needs are different. That’s why we’ve picked the best benches among the 3 different types that we’ve outlined above and compiled them into this list. For maximum stability, consider getting a bench with a shelf. While most of these benches are rated to handle 250 lbs, you will notice less movement while sitting with the added support of the shelf. Plus, the extra storage space is nice. There are a ton of different options and styles with teak and bamboo benches. You can click the links below to skip to whichever section interests you the most. Teak and bamboo benches in a shower are frequently being exposed to a wet, humid environment. There is a small amount of upkeep required to maintain teak and bamboo benches. Bamboo shower benches require more upkeep than teak, but they’re usually less expensive. Why does bamboo require more maintenance? Wet bamboo becomes more soft and pliable. Of course, you’ll be sitting on a shower bench, so as you can imagine you will occasionally need to tighten screws as the bamboo flexes. Teak doesn’t get a free pass here and is still susceptible to mildew, but it doesn’t seem to occur as rapidly or abundantly as with bamboo. Keep it dry? It’s a shower bench. What do you expect? Well, yes, much the same way your shower curtain or tile grout molds, wood fibers will also grow mildew. Keeping your shower door open or letting your bathroom fan run until the humidity is back to normal can help. Additionally, wiping off excess water on your bench will help avoid water stains and mildew. What about treating the bamboo or teak with a wax or soap? That’s part of the ongoing care of your bench and we recommend you wipe them down when you start to notice and mildew growth. A properly built shower is going to have a sloped floor, so of course you might wonder how a rigid wood bench will sit on an uneven floor. All the AquaTeak benches we’re showing here have adjustable feet to accommodate a sloped floor so that you don’t have deal with an annoying bench that rocks back and forth. 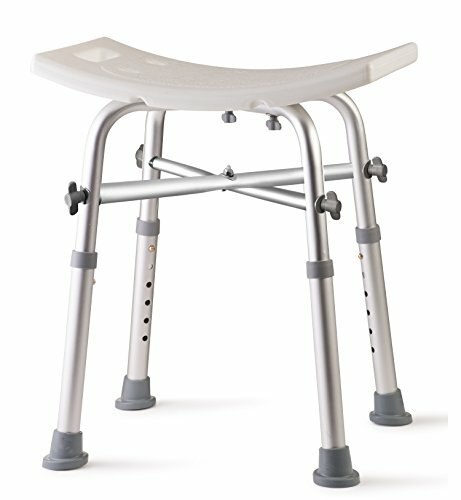 If for some reason a particular model doesn’t have adjustable feet, then we’ll note that in our product comparison table. Many of the bamboo benches don’t come with non-slip feet, which also helps keep the benches legs from coming into contact with water on the floor, so for those benches you could purchase these non-slip pads that screw into the legs. We’ve grouped the selection of teak benches into categories based on their shape and style. You’ll notice that majority of the teak products we’re showing are from AquaTeak. They source their teak wood from sustainable plantations in Indonesia, which is one of the world’s largest teak exporters. The overall quality and design of AquaTeak’s products are something we’ve been happy with, and a majority of online reviews of there products are overwhelmingly positive. This isn’t to say there aren’t other good sources of teak benches and seats, DecoTeak is another popular option, but the variety of AquaTeak’s lineup is hard to beat. If you’re looking for maximum comfort, the benches with a sling seat are very comfortable. Corner benches seem less intrusive in a walk-in shower as they conform to a 90-degree corner. Teak wood is known for it’s durable, water-resistant qualities while also being beautiful. It’s native to southeast Asia, but it has been cultivated in Africa and the Caribbean. Naturally occurring teak is most abundant in Myanmar, accounting for half the world’s supply, but plantation teak is a sustainable alternative that helps preserve the world’s supply. Indonesia is the home of most teak plantations and accounts for the majority of the commercially harvested teak used for producing furniture, boats, veneer, and many other wood products. Plantation teak has been shown to perform just as well as old, naturally grown teak, but is more susceptible to color change from UV exposure; the color change does not affect its durability. The silvery-grey finish you see on older teak furniture is what happens when you don’t apply regular coats of teak oil. For shower benches, you will notice this change slower than if your bench was outside in sunlight. Teak wood is naturally resistant to water damage and mildew. To maximize the life of your teak shower bench, you need to wipe it down with Teak Oil periodically. This is not a strict requirement, but it’s easy to do and will add life and color to your teak bench. 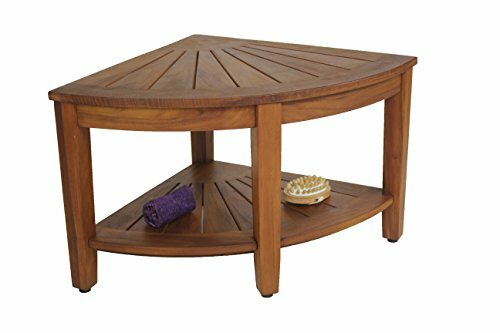 Be aware that different kinds of teak oil may have a stain or poly coating mixed with it. The AquaTeak oil we linked above is excellent, and you can optionally bundle with most of the benches we’ve included in our product tables. 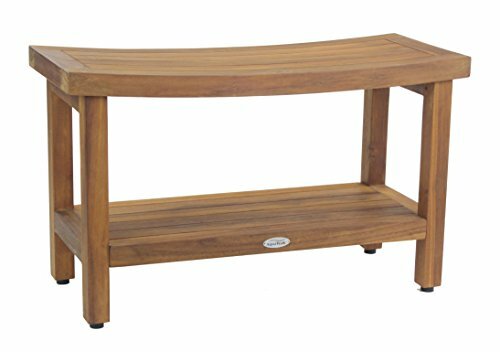 14" x 10" x 15"
18" x 12" x 18"
Sturdily built, this shower bench by AquaTeak is made from 100% sustainably harvested teak wood. The non-corroding stainless steel hardware and rubber gripping feet make it ideal for a small bench to go in your shower. The simplicity that makes this beautiful teak bench attractive. I see simple flat surfaces with no nooks and crannies I’m going to have to try to keep clean. Now, this bench does have space between the slats that form the seat so that water doesn’t pool. This doesn’t cause any issues, and there is no need to worry about getting this area 100% covered in teak oil. Teak can withstand moisture, so merely applying the oil over the surface will provide adequate protection for this stool. Be aware that some water will remain on top of the wood. Any flat surface will maintain some water on top, so just giving the bench a quick wipe with your hand, before getting out of the shower, will go a long way in helping keep as much water as possible from sitting on the bench. Applying a routine coat of teak oil will be no problem. The most important and best feature of this bench is that it’s sturdy. The quality of the joints are excellent, and you shouldn’t have any unpleasant surprises sitting on this bench. Many poorly made teak shower benches have 4-star reviews, and yet there are pictures of where benches have collapsed under people. This bench is capable of handling 250 lbs of weight, and should not collapse under someone that only weight 120 lbs. Nor should any bench meant for sitting! Also, you get a 5-year warranty if you have any problems with defects. The grate style is a popular alternative to the smooth lines of the Asia benches. The waffle-like grid makes it harder for water to pool. Notice that the grate-style benches do not have curved seats. This doesn’t make them uncomfortable for sitting, but if you plan to use the top for setting down bottles then you might prefer the flat top of the Grate. 24" x 12" x 18"
24" x 14" x 18"
30" x 14" x 18"
36" x 14" x 18"
36" x 12" x 18"
Slats spaced so water drains off top and shelf. In case you haven’t noticed, AquaTeak has some of the best quality teak furniture products. This bench is no exception. The Sumba bench has a similar style to The Original Asia bench, but is 30 inches long. If you’re looking for something wide and with a little storage, then this is a good choice. This 30″ wide teak bench gives you extra space for sitting plus a shelf. 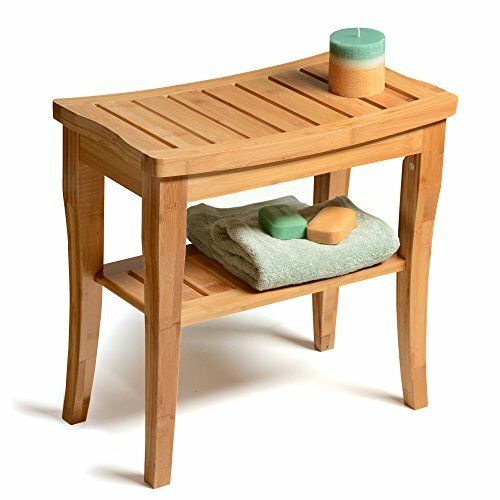 This is a spa-style teak bath bench with feet that can be leveled by screwing in or out the rubber-tipped feet. The distance between the shelf and the seat is about 10″, so you can fit tall bottles with no issue. If your bathroom has a natural theme with stone-like tile, then the natural look of these teak benches complements that style. You can still put these benches in fiberglass showers, but this model is very wide. The 18″ model above will be better suited for a small fiberglass shower. The sling seats are much more comfortable than sitting directly on wood, as you might imagine. They can hold the same weight as the solid teak tops and quickly dry out. The seat is made from a custom taupe fabric and is waterproof and durable. The added stability of the shelf is a big bonus for the white sling model, and it’s a great deal for the width and comfort upgrade. We highly recommend getting the model with the shelf as the sling doesn’t provide stability like with the solid teak tops. Corner benches are a great way to take advantage of space you might not use otherwise. If you have a smaller walk-in shower, then these are a great choice. 15.5" x 15.5" x 18"
15.75" x 15.75" x 18.5"
The design of corner benches adds a unique look to the corners of a room where we often have empty space. The pattern of the teak slats looks like a sunburst coming from the wall corner. Square tables placed in a room corner can only be set on one side of the wall or need to be catty-cornered, which neither looks good or takes full advantage of the space. This bench is perfect for a walk-in shower add a natural look, and the corner bench design takes full advantage of the corner space of your shower. To better explain the dimensions of the 15.5″ Original Kai above, if you measure outward from the corner to the edge of the bench then that radius is 15.5″. The bench is 18″ tall. The distance between the bottom shelf and the top shelf is 12.5″, which is plenty of room for just about any bottle. This is an extra-large version of the model above if you’re looking for storage room. Holds a maximum of 250 lbs. Also made by AquaTeak, this is the 22″ version of the bench above. If you have a large walk-in shower, then this is the bench for you. The sunburst pattern of the teak wood is beautiful, and you don’t have to sacrifice functionality for style. To clarify the dimensions, the bench is 18″ tall, 22″ from the wall corner to the outside of the bench (radius). The 31″ measurement is the length of the arc from one side to the other. 16.75" x 13" x 17.5"
20" x 14.25" x 18"
16" x 12.5" x 17"
18" x 13.5" x 19"
The portability and convenience of the folding teak seats make them great for more than just showers. Notice the variety of finishes on the benches in our table. The Paradise Teak model is raw teak and will work just fine as it is, but if you want to maintain the look of the wood you should apply a coat of teak oil before putting it in your shower. The other models come pre-treated from the manufacturer, but will still require you to coat them with teak oil a few times per year. These are a more permanent solution for your shower seating needs, so why not do it with style? Moen and Teakworks4u are great brands in this category. They have top-of-the-line products that are built to last. If you’re going to go drilling through tile or stone, then you want something that can stand the test of time. These must be mounted into wall studs to meet the specified weight capacity. 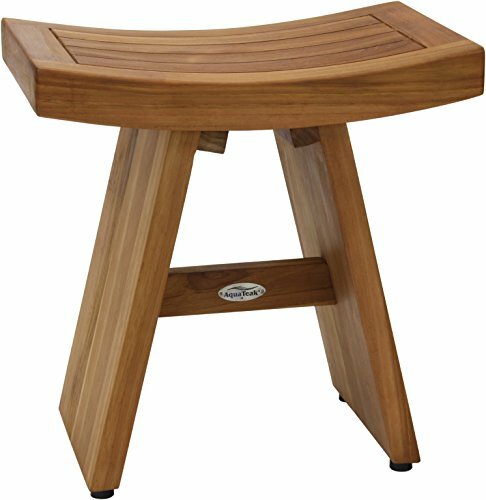 12" x 12" x 13"
The Kai is a small teak footstool that you can use to prop your feet up in the shower for shaving legs. You could probably sit on it, but it’s not going to be comfortable. At 13 inches tall, it’s significantly shorter than the teak benches above, but could work as a kids stool. Teak furniture gradually fades to a natural silver-gray color when exposed to water and sunlight. You won’t have to worry about sunlight in your shower so you won’t have to deal with the usual problems of outdoor furniture. If you’re restoring a bench after it has already turned silver-gray from exposure, then you’ll first need to use teak cleaner to remove the thin patina layer. In order to maintain the original finish of your shower bench, you will need to occasionally apply a coat of teak oil. You can also use a diluted solution of distilled white vinegar to clean up hard water stains and mildew. Teak oil only needs to be applied a few times per year. It’s not something you’ll have to worry about weekly or monthly. Bamboo as a building material is less expensive than teak wood, but also comes with its own share of problems when introduced into the conditions of a shower. Bamboo used to make furniture, flooring, and other everyday household items (or even an entire house!) is not sawed from a tree trunk in one big piece. Bamboo trees aren’t that big! Instead, bamboo is cut and laminated into sheets and planks that are then used to make many different products. This type of bamboo should be treated to resist insects and rot. Remember, you will still need to treat your bamboo bench with mineral oil, teak oil, or another type of wood treatment. The constant exposure to water from a shower may cause mildew to form if your bathroom has poor ventilation and remains humid. Leaving a bathroom fan on or keeping the door open can help quickly reduce the humidity. 18.7" x 10.2" x 17.5"
18.85" x 9.75" x 17.7"
18.7" x 9.6" x 17.7"
24" x 13" x 18"
The 18.7″ Giantex bamboo bench specifies a 187 lbs limit. Oddly specific, huh? As with the teak benches above, if you want maximum stability you should get a bench with a shelf. Majority of the bamboo benches come with shelves and all of the rectangular ones we’re showing here do. Due to the heat and water exposure bamboo tends to grow and shrink over time. This means that the bolts holding your bench together may loosen so you will need to tighten them up occasionally. You can just check them every time you go to clean the bench. You’ll likely want to retreat your bamboo bench every time you go to clean your shower. Just make it a part of your routine. That will ensure you get the most life out of your bench, and it won’t feel like extra work. 19.2" x 18.8" x 2.8"
15.7'' x 15.7" x 17"
15.8" x 17" x 15.8"
Being able to wedge these corner benches against two walls certainly helps with stability. 17" x 13.2" x 17.6"
11" x 11" x 12"
Be careful with these folding bamboo seats, as not all of them are very tall. Some models are meant to be used as footstools for shaving, while others are intended for sitting as well. They do not come with any option for adjustable or non-slip feet. Organic or Natural Soap rather than harsh detergents are best for cleaning up mildew. Regularly treat your bamboo bench with mineral oil after cleaning it. To avoid growth of mildew, wipe water off the bench completely and leave it in a place with good air circulation. For better protection, we recommend the use of a bamboo sealant to create a longer-lasting waterproof finish. To remove mildew, spray the bench with a mild bleach solution and wipe the mildew off with a microfiber cloth in the direction of the bamboo grain. The more functional and maintenance-free alternative to the attractive teak and bamboo benches are these metal and plastic stools and seats. If you want an adjustable seat and possibly even a back on your seat, then you’re in the right place. You don’t have to treat metal or plastic with oil, so that’s a plus. This bench is very light and adapts to the height you need. The non-slip rubber feet are more robust than the feet on the teak benches above. Fits in smaller tubs and showers. One of the most popular shower benches available from Amazon, this one is affordable and durable. It is much lighter than the teak shower benches by roughly 80%. The feet are exceptionally stable and have anti-slip rubber tips. You will need at least 16″ x 17″ clearance for the legs to fit in your shower. The seat is 17″ x 10.5″, which is about the same size as the Top Pick AquaTeak bench above. If you’re looking for a very functional and adjustable bench, then this is for you. It’s not the most beautiful shower bench, but it’s affordable, comfortable, and reliable. Plus, there’s no maintenance! 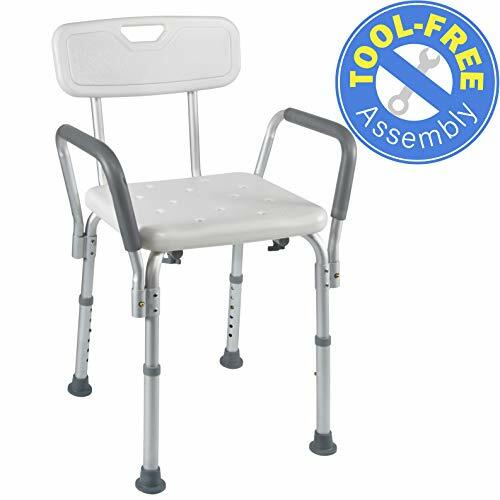 If you’re looking for back support then this is a great option from Vaunn Medical with a nice height range to choose from. Holds a maximum of 300 lbs. With this bench, you will get extra comfort and support from the removable back and larger seat. You get slightly more sitting room than Dr. Kay’s Shower Chair above. The legs span a width of 14″, so be sure you have a wide enough shower or tub. Trying even slightly to bend the legs to make them fit can compromise the stability, so pick a bench/chair that fits. This bench is designed for helping you enter and exit your bath or shower. The chair is padded with pivoting arms and a swivel seat. The quality of this bench is top notch. Platinum Health is a well-known and tested brand that has a solid reputation for safe products. Customer’s opinions are overwhelmingly positive for this transfer bench. As far as transfer benches go, this one has a great reputation. Consumer reviews are clear that the quality and comfort of this bench is superb. Don’t take our word for it, check out all the reviews. The seat and back are covered in soft padding instead of the usual hard plastic. The 360-degree swivel and locking seat provides a comfortable and safe way to exit or enter your bath or shower.